February 23, 2017, 3:52 PM · Are you creating good habits? A few years ago I picked up a book in the airport called The Power of Habit, which made a convincing argument that our habits control nearly everything we do, every day. We have so many habits, and yet we notice very few of them. I thought about this when a teaching colleague, Cheryl Scheidemantle, was describing a lesson she'd been teaching her third-grade beginning violin class. I realized that her lesson could apply just to the most advanced player, as well as the beginner: Mind your habits! "Do any of you have any habits?" she asked the kids in her class. They did, and they told her a few healthy ones: brushing their teeth, eating breakfast slowly, arriving to school on time. They confessed to a few bad ones, too: staying up too late, watching too many videos, forgetting to clean their rooms. She explained that we also have violin-playing habits. For example, some good violin-playing habits might include standing upright as we hold the violin, holding the bow correctly, playing notes in the right order, producing a beautiful tone. There are also bad habits: droopy posture, collapsed violin wrist, stiff bow hand, out-of-tune notes, squeaky sounds. Using a piece they all knew well, ("Hot Cross Buns"!) she said that they could always just play it on auto-pilot, but better yet, "you could use it as a chance to work on a a habit." She encouraged them to each pick one special habit that they'd like to improve and to think about that as they played. Like magic, she saw scrolls lift, bow fingers find the right spots, violin wrists straighten. Of course, none of this business about habits is news to us violinists; most of us have accepted the notion that "practice" is the path to better playing. The more you ingrain a good habit, the more it becomes what you do. But this wonderful quality about practice can also be its downfall: practice does not make perfect, practice makes permanent! "If you aren't purposely practicing a good habit, you might be accidentally practicing a bad habit," Mrs. Scheidemantle warned. For example: How many times have you missed that shift? Played that note too high? Made that particular squeak during a string crossing? Here's something that's a testament to the power of (bad) habits -- I was once resurrecting a Mozart concerto, something I'd studied some 10 years before. I came to a certain passage and noticed that I was playing a particular note flat. I went to mark it, only to find an arrow already marked in the music! I'd habitually made the exact same mistake, 10 years before. It was that ingrained. The good news is that we are far more consistent than we think we are. That isolated mistake, that incident with the squeak or the bad note or the missed shift -- chances are you actually do it just about every time. The trick is to identify your habits. What do you want to change about the way you are doing something? What new skills or habits would you like to add? Then, pay attention! Use your time to create the best habits you possibly can. Practicing 21 Day in a Row! February 24, 2017 at 02:08 AM · lol I was desperate for something to read! 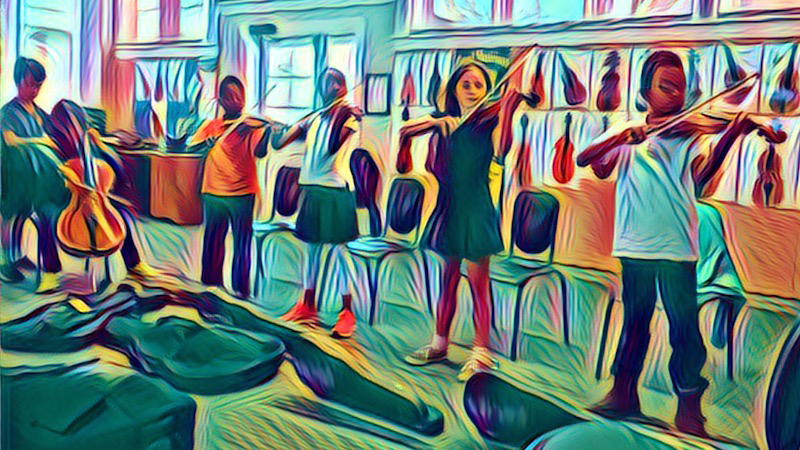 February 24, 2017 at 05:11 AM · I think a whole book could be written about how to break a bad violin habit. Mine was/is a drooping little finger on the left hand which would not stay out of the way when crossing strings. I have devised a set of exercises to counteract this tendency and I am starting to see some results now but it has taken many months to get here. Of course, if I had been having regular violin lessons then a teacher would have picked this up years ago before it became a real problem. This is why I tell people that self teaching on the violin is such a VERY bad idea : it is so hard to break a bad habit. February 24, 2017 at 05:14 AM · Great article!!!!! February 25, 2017 at 04:18 PM · Thank you for these words of wisdom! February 26, 2017 at 06:20 PM · Breaking a habit is hard to do -- sometimes it's harder to recognize that you have one to break! February 27, 2017 at 02:41 PM · Breaking good habits is also hard to do, even though we don't want to break those. Eating vegetables, going for a walk are good habits. I taught myself touch typing....you know those drills: kkkk..dddd...mmmm over and over. I goofed up on the i and e. I got them reversed. That was many years ago and today I have to think about it. There's not time to think. My violin teacher made me write down goof ups that I was doing over and over. Laying my fingers flat was the worse. "Claw fingers please." I have it written down. No wonder I heard 'ghost notes' from the neighboring string. "Stop slamming your fingers down on the board." was another. I'm still dealing with that one.